Fifteenth century Polish prince, the younger son of King Casimir IV of Poland and Elizabeth of Austria. 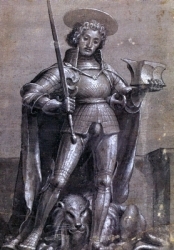 Grand Duke of Lithuania in 1471; third in line for the throne. Lived a highly disciplined, even severe life, sleeping on the ground, spending a great part of the night in prayer, dedicating himself to lifelong celibacy. 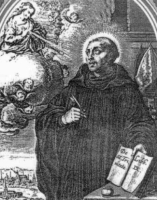 He had a great devotion to Mary, supported the poor, and lived a virtuous life amid the dissolute court. 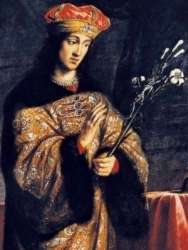 Hungarian nobles prevailed upon Casimir's father to send his 15-year-old son to be their king; Casimir obeyed, taking the crown, but refusing to exercise power. His army was outnumbered, his troops deserting because they were not paid. Casimir returned home, and was a conscientious objector from that time on. He returned to prayer and study, maintained his decision to remain celibate even under pressure to marry the emperor's daughter. Reigned briefly as king during his father's absence. By the power of the Holy Spirit, Casimir burned with a sincere and unpretentious love for almighty God. So rich was his love and so abundantly did it fill his heart, that it flowed out from his inner spirit toward his fellow men. As a result, nothing was more pleasant, nothing more desirable for him, than to share his belongings, and even to dedicate and give his entire self to Christ's poor, to strangers, to the sick, to those in captivity, and to all who suffer. To widows, orphans, and the afflicted, he was not only a guardian and patron but a father, son, and brother. He actively took up the cause of the needy and unfortunate and embraced it as his own; for this reason the people called him the patron of the poor. Though the son of a king and descendant of a noble line, he was never haughty in his conversation or dealings with anyone, no matter how humble or obscure. Eldest of twelve brothers in his family. Studied at the Inter-Brescia seminary where he became friends with the future Pope Paul VI. Graduated from the Pontifical Gregorian University in Rome, Italy in 1922, and was ordained as a priest on 9 July 1922. Taught philosophy at the Inter-Brescia seminary in 1923. Joined the Jesuits in Gorizia, Italy in 1924. Chair of the philosophy department in Scutari, Albania from 1929 to 1932. Chair of the department of philosophy in Mantua, Italy and leader of the Jesuits there in 1932. Father Gjon suffered from lengthy health problems which required regular treatment and reduction in his work schedule from 1932 to 1936, but on 2 February 1936 he made his solemn profession in the Jesuits and returned to full-time adminstration, teaching and ministry. Rector of the Pontifical Seminary of Scutari and its adjoining Xaverian college in July 1942. Worked to start a Christian-Muslim dialogue in Albania. Transferred to Tirana, Albania in 1943 where he worked to help and protect all Albanians in the privations and persecutions of World War II. Vice-provincial of the Jesuits in Albania in 1945. Arrested by the Communist regime on 31 December 1945, and in a show trial, was sentenced to death for being a spy for the Vatican and a traitor to Albania. Martyr. Son of Loros and Maré Ashtés. Studied at Franciscan schools, and became a Franciscan Friar Minor novice on 4 October 1922, making his perpetual vows on 13 September 1928 and taking the name Gjon. Studied theology in the Netherlands. Ordained a priest on 15 March 1931. Studied science, history and philosophy in Louvain, Belgium. Received a doctorate in philosophy from the Sorbonne University in Paris, France in 1937. Back in Albania he taught philosophy and French at a number of levels, and served as a spiritual director to many of his students. An open anti-Fascist, he was forced to flee to Yugoslavia when the Italians invaded Albania. Returning home, he ministered to those suffering in the privations of World War II, and continued to speak against Fascism and Communism. Helped found the Christian Democrats in Albania which led to his arrest by the Communist regime that took power after World War II; he was arrested in a class room in the middle of a lecture. He spent several months being tortured in prison, was finally given a show trial, found guilty of treason against the Communist government, and on 22 February 1946 he was sentenced to death. Martyr. Qerim served in the Albanian gendarmerie in the reign of Zog I, rising to the rank of lieutenant. During World War II, he ran a shop and avoided politics. He married Marije Vata in September 1944. After the war, when the Communists took over Albania, Querim was known to be anti–Communist, pro-Albanian nationalist, and a very pious Catholic, spending much time in prayer and none in violence. He was arrested on 3 December 1945 for opposing the mandatory, one-party-only vote, and for being a member of the Albanian Union, which the Communists considered violent fascists. After a show trial, Qerim was sentenced to death. Martyr. His only child was born six months after his death. Pagan officer and body guard at the imperial court of Nicomedia. Adrian was so impressed by the strength and faith shown by persecuted Christians that he declared himself a Christian, though he had not even been baptized. He was immediately arrested and tortured. He and fellow prisoners were tended by his wife, Saint Natalia until they were executed. Feeling an early call to the priesthood, Daniel entered the Pontifical Seminary in Scutari, Albania at age 12. He joined the Jesuits in Gorizia, Albania on 8 July 1926, and made his final profession on 2 February 1942. He studied philosophy in Chieri, Italy from 1931 to 1933, and then returned to Albania in 1935 to teach Latin in the seminary. Ordained a priest on 15 July 1938. In 1940 he resumed teaching at the Scutari seminary, worked parish missions and conducted religious education in mountain parishes. Rector of Saverjane College and the Pontifical Seminary in 1944. Arrested by Communist authorities on 31 December 1945, accused of being part of the leadership of the anti–Communist Albanian Union. Father Daniel had nothing to do with the group, but following a show trial, he was executed. Martyr. Second of five children in a devoutly Catholic family; his father was a school teacher and principal. Graduated from a Benedictine high school in Esztergom, Hungary in 1909. With the support of Cardinal Kolos Vaszary, Zoltán then a studied in Rome, Italy at the Collegium Germanico-Hungaricum and Pontifical Gregorian University where he earned a doctorates in philosophy in 1912, theology in 1913 and a degree in canon law. Forced to leave Italy at the start of World War II, he finished his studies in Innsbruck, Austria, and was ordained there on on 28 October 1915. Chaplain of Komárom, Hungary. Assigned several administrative tasks and positions at the archdiocese office Esztergom from 1917 to 1937. Auxiliary Bishop of Esztergom, Hungary and Titular Bishop of Sinope on 22 September 1937. Worked to keep the see functioning as the archbishop and other officers were imprisoned in the anti–Christian persecutions of the Hungaian Communists. On 29 June 1950 it was Zoltán’s turn; he was imprisoned, isolated, tortured, starved, abused, and set to forced labour until his health was finally destroyed. Martyr. Born to the Salerno nobility; relative of Saint Alferius of La Cava. Benedictine monk at Cava, Italy while still a young man; his abbot was Saint Leo of La Cava. Lived for a while as a hermit, and then was assigned to Cluny Abbey from 1062 to 1068. Bishop of Policastro, Italy in 1079; after two years of service, he resigned the see and returned to Cava where he served as co-adjutor abbot with Saint Leo. He was chosen abbot and tried to introduce the Cluniac reform, but was so strict that he caused strife in the house. He withdrew from office for a while, and even formed a house in the Cilento region of Italy. However, he was later recalled to La Cava and served decades as abbot with a much more fatherly attitude. During his time he brought in over 3,000 monks who then went out to found other houses and spread the Faith. One of eight children of a farm family. Niece of Saint Marie Madeleine Postel. Joined the Sisters of the Christian Schools at age 18, taking the name Placide. She had little education, and studied for a while at Argentan, France. Worked in school administration, founded new convents, and served as novice mistress. Assistant-general of the Sisters at 26, an appointment that caused great resentment among her sisters. Mother-general of the order at age 31 on the death of her aunt. Directed the institute, orphanages, nursery and elementary schools for the next 30 years, opening 36 schools for the poor in Normandy. Obtained papal authority for the order in 1859 from Pope Pius IX. Worked herself to death organizing relief during the Franco-Prussian War in 1877. A lifelong layman in the archdiocese of Shkodrë-Pult, Albania, Gjelosh was educated by Franciscans, and studied at the Shkodër Seminary. He was a soldier, worked as a secretary, and was a member of the anti–Communist group, Albanian Union. Gjelosh was arrested on 3 December 1945 accused of treason for not supporting Communism, and of being a Vatican spy for remaining a devout Catholic. He was given a show trial on 22 February 1946, convicted, and sentenced to death. Martyr. Son of Pedro and Francisca Bellame. Studied at the seminary in Vicenza, Italy, and taught there while still a student. Ordained on 15 January 1827. Founder of the Institute of the Sisters Teachers of Saint Dorothy, Daughters of the Sacred Heart in 1836; they are dedicated to teaching the poor. Bishop of Treviso, Italy on 20 September 1850. Ordained the future Pope Saint Pius X on 18 September 1858. Bishop of Vicenza on 28 September 1860, a seat he held until his death. Lifelong layman; tailor by trade. An informal but enthusiastic evangelist for Catholicism. While in London, England seeking treatment for a leg wound, he was imprisoned in Newgate for the crime of harbouring priests; the chains and lack of medical care led to amputation of the injured leg. His friends petitioned for his release, which was granted, and Nicholas resumed work as a tailor at Smithfield, London. Arrested again for harbouring priests, he was thrown into Bridewell prison, tried for the crime of making clothes for a priest, and sentenced to death. Martyr. Married. Widow. On 25 May 1803 she founded the Sisters of Charity of Saint Louis in Vannes, France for the education of poor and abandoned girls. Drawn to religious life in his early teens. Had a great love of literature, especially Catalan, and wrote poetry. Professed cleric in the Sons of the Holy Family. Entered the seminary in Barcelona, Spain, but it was closed at the outbreak of the Spanish Civil War. Captured, tortured and executed for trying to protect a church's icons. Martyr of the Spanish Civil War. Son of Count Amadeus III of Savoy and Matilda of Vienna. Educated by Blessed Amadeus of Lausanne. Count of Savoy from age 13 when his father died. Married several times; widower several times. Joined the Carthusian monastery at Haute-Combe, but was obliged to resume political charge of the Savoy. Eventually assumed a Cistercian habit. Educated at Rome, Italy and Rheims, France. Ordained at Douai, France in 1587. Returned to England in 1588 to minister to covert Catholics, using the name Christopher Evers. Arrested and martyred for the crime of priesthood. Benedictine monk at the abbey of Saint Peter of Ciel d'Oro, Pavia, Italy. Steward of his house's goods. Hermit at Comacchio, Italy where he evangelized the area. Professed cleric in the Sons of the Holy Family. Seminarian. When the persecutions of the Spanish Civil War began, he tried to flee to Rome, Italy to continue his studies. However, he was imprisoned and executed for his faith. Martyr. Benedictine monk. Abbot of the run down abbey of Ottobeuren. Under his leadership, the house had a resurgence, and both the place and Rupert became known for their piety. May have been a member of the Hungarian royal family. Missionary bishop on the isle of May in the Firth of Forth off the western coast of Britain. Martyred with fellow missionaries by Danish invaders. May have evangelized in Ireland. May have been bishop of Saint Andrews; records are unclear. Leader of a group of martyrs killed by pagan Dane. Priest in the diocese of Pinsk, Belarus. Martyred in the Nazi persecution of Christians. Priest in the diocese of Vilnius, Lithuania. Martyred in the Nazi persecution of Christians. Hermit on Ouessant Island, France. Benedictine monk at Saint Benoit sur Loire monastery, Fleury-sur-Loire, France. Assigned to restore the great Rhuys abbey which had been founded by Saint Gildas the Wise and later destroyed by the Normans. Layman. Condemned for harboring priests. Martyr. Seventh-century benedictine monk. Abbot of Saint Maximinus monastery in Trier, Germany. Bishop of Trier. Assisted English missionaries in the area, including Saint Willibrord of Echternach. Known initially for his powerful build, fiery temper, and bullying demeanor. 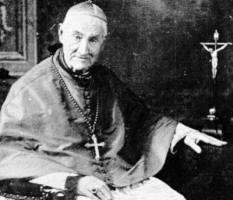 In later life he reformed, took his religion seriously, spent 30 years as bishop of Avranches, France, and was proclaimed a saint by the parishioners in his see. Steward in the household of Saint Etheldreda. Monk at Lastingham, England, and then near Lichfield, England. Spiritual student of Saint Chad. Officer in the Roman emperor's palace. Martyred with 27 companions. Fourth century missionary bishop who evangelized in Cyprus. Martyr. Group of 900 martyrs buried in the catacombs of Saint Callistus on the Appian Way, Rome, Italy. A group of 20 Christians murdered together for their faith. The only details about them to survive are three of their names - Archelaus, Cyrillos and Photius. A group of 4th century missionary bishops who evangelized in the Crimea and southern Russia, and we martyred for their work. We know little else beyond the names - Aetherius, Agathodorus, Basil, Elpidius, Ephrem, Eugene and Gapito.